Indian classical music is one of many forms of art music that have their roots in particular regional cultures. For other "classical" and art music traditions, see List of classical and art music traditions. ^ Nazir Ali Jairazbhoy (1975). Arthur Llewellyn Basham (ed.). A Cultural History Of India. Oxford University Press. pp. 212–215. ISBN 978-0-19-821914-9. ^ a b Bruno Nettl (2016). George E. Lewis and Benjamin Piekut (ed.). The Oxford Handbook of Critical Improvisation Studies. Oxford University Press. pp. 176–178. ISBN 978-0-19-989292-1. ^ "Announcement of The 17th Sangeet Sankalp Saptaah 2012". saptak.org. Archived from the original on 11 June 2010. 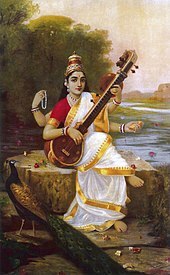 Wikimedia Commons has media related to Musicians from India.